By the Rev. W. Crwys Williams, once Pastor of the Church, 1898-1914. W. Jones, Carlyle Printing Works, Abertillery, 1927. Photographs copyright 2004 by Jeffrey L. Thomas. Below right: this impressive marker that once stood at the church now rests in the Brynmawr and District Museum on Market Street in Brynmawr. Below you will find excerpts from the book mentioned above by the Rev. W. Crwys Williams, detailing the history of Rehoboth church in Brynmawr, Wales. Rehoboth, located on King Street, was built in 1827 and was the first non-conformist chapel built in Brynmawr. For this page I have featured primarily excerpts from the book covering the establishment of the church in Brynmawr and its early years in the community. 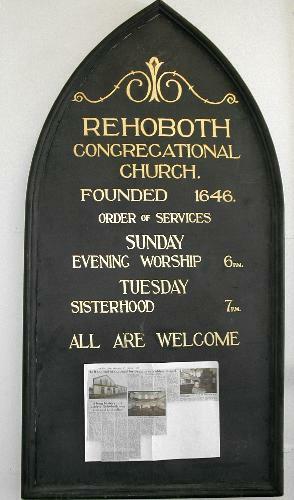 Rehoboth was an offshoot of Horeb Chapel in Nantyglo built in 1819. 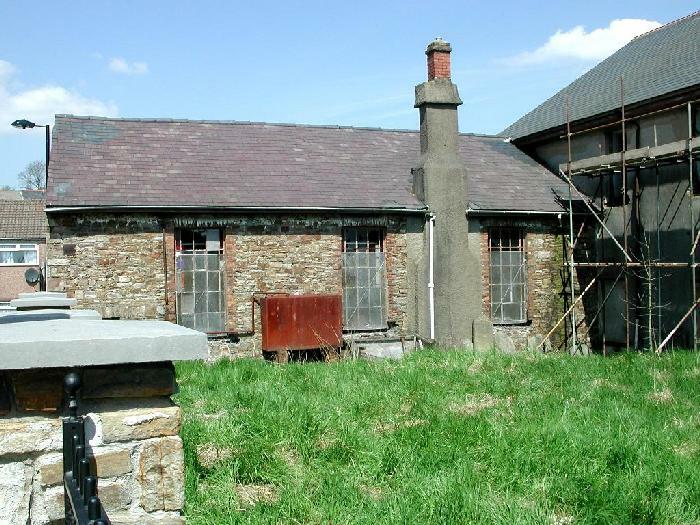 By 1825 Horeb had become too small for the growing congregation, and many of its members moved to Brynmawr where a new chapel was built in 1827. That church was Rehoboth. In the first chapter Rev. Williams places the founding of the church in context with the turbulent times of the Civil War. Following this brief explanation we jump to a chapter covering the building of the new church in Brynmawr, a feat made possible by a generous loan from local tradesman John Thomas. Williams points out that the building of the church coincided with a great general revival in the region, that "continued for some years," and that membership increased dramatically during this time. Although the book reads as though Rev. Williams is delivering a sermon on the history of Rehoboth, he manages to weave into his narrative valuable bits and pieces of Brynmawr's social history as well. He even makes a few comments about genealogy and tracing ancestors! This makes the book useful for both the religious and the social historian. We conclude by presenting a chapter on the life of the Rev. David Stephenson, an important and influential preacher in Rehoboth's early history. Sadly, this historic church, that was an integral part in the town's industrial expansion of the 19th century, is being torn down at this very moment (May 2004). The photograph of the church above is likely the last you'll see of this grand old lady, as shortly after it was taken (April 2004) workers began tearing off the slate roof. 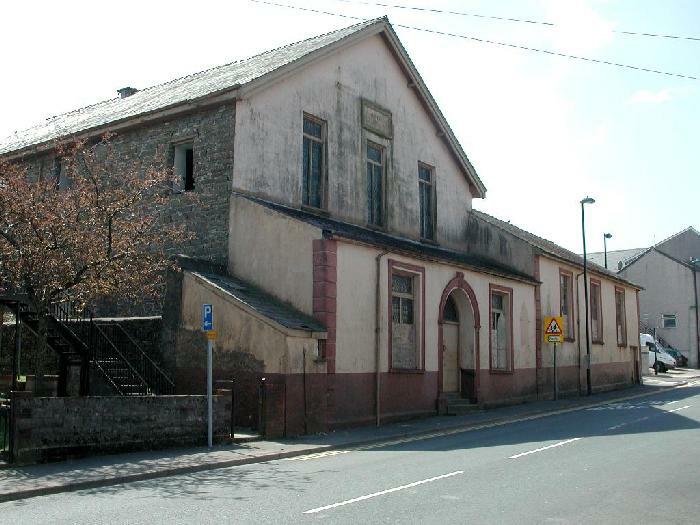 There's a lot of Brynmawr history being lost with the destruction Rehoboth, and it's a great shame that some other use for the building could not be found. Therefore, this page stands as a tribute to the men and women of Brynmawr, who helped found and sustain not only this important church, but the community at large. once Pastor of the Church, 1898-1914. It is not by any means an easy task to fix the year when Rehoboth Church was founded. But we know it happened during the stormiest period in the history of the Church and State in our land - towards the close of the Civil War. Had the times been more normal and peaceful it would have been easier to fix the date. But it was a time of terror and revolution; thrones were tottering, and princes were brought low; old orders were changing, yielding place to new; castles were smitten, and in such times as these a date was a mere detail, and the chime of a clock but a faint thing indeed. An incident occurred when so-and-so was in prison, or when a cathedral was laid in ruins, or an army was slaughtered. In Monmouthshire we see the immediate result of the struggle for civil and religious liberty in the founding of Llanfaches Church, the first Nonconformist Church in the Principality. This was in 1639. The incident is full of stupendous significance. The great movement that led up to it was, in four years, to shake England and its Constitution to their very foundations, while the result of it was the beginning of a new era in Church history so far as our country was concerned. Peace, however, was the norm at Horeb, and, as we have seen, prosperity. Already the church was too small, and the project of a new chapel was being discussed. But where was it to be built? And as if one disagreement were not enough, another arose over the site of the new chapel. The majority deemed it unwise to enlarge the existing premises at Caban Gwyn, and recommended building a worthy temple at Brynmawr, where the population was fast increasing and where according to all signs there would be a big population soon. There was evidently substantial enough a majority in favour of the new scheme, site and all, and the chapel was proceeded with forthwith, and so the Rehoboth we know today was built. Money seems to have been the only deterrent to a speedy execution of the scheme, for it was a church of working people in the main, and large things had commenced to appeal to them. The new scheme was going to cost �0. Where was the money to come from? He Who had put the new temple in their hearts was going to find the ways and means as well. Mr. Stephenson discussed the scheme with a Brynmawr tradesman and his wife - a Mr. and Mrs. Thomas. On hearing the earnest man's plan and appeal, Mrs. Thomas said to her husband: "Jack, you must see to it and help him carry it through." The good husband agreed to the suggestion and lent the necessary sum of �0 free of interest. This act of benevolence arouses a sense of curiosity in us, and makes us feel we would like to know more about this Mr. Thomas. The only thing we know about him is that he was not a professing Christian, a description which only deepens the mystery, increasing our admiration of him at the same time. They were evidently Christians, he and his wife, but did not believe in parading their faith. Where did they carry on business? Where did they hail from? What of their offspring? There is no answer to any of these questions. Save for this glorious act of generosity their names are wrapped up in almost annoying mystery. Yet what a deed to save their names from oblivion! Who knows what might have happened had they withheld their willing hand in this hour of need, as they well might, reminding the professing Christians of the need to add works to their faith. On November 7th and 8th, 1827, the new Chapel was opened with much jubilation. The officiating ministers were Revs. J. Daniel, Pontypool; M. Ellis, Mynyddislwyn; L. Powell, Cardiff; G. Hughes, Groeswen; and others. One notices the absence of the name of the Rev. Ed Jones, Pontypool, from the list of officiating ministers. He was now in failing health, and soon passed away after this event. It was more than providential that the opening of the new Chapel should be accompanied by a revival. At the first Communion service held at Rehoboth it was the privilege of Mr. Stephenson to receive eight new members, and we are told that in his great excitement he omitted to give the hand of fellowship to the eight, and on being reminded of his remissness he declared: "And I receive you too, in the name of the Blessed Trinity." An indefinable wave of feeling swept over the whole place at this very moment, and scenes of hysterical ecstasy were witnessed. This fervour continued for some years, and so many additions were made to the church that by 1832 the membership of the church stood at 250. In the meantime a great effort was made to honour the pledge to repay Mr. John Thomas the sum of �0, and to the credit of the church, be it said, that in two years and ten months every penny of it was repaid and the new Rehoboth was free - free and unfettered to enter upon greater and more spiritual projects. According to the custom of those times, the Rev. Dd. Stephenson toured the land, collecting in well-disposed churches sums of money both large and small. We shall be able to tell some interesting stories about this wonderful man in this direction later on. We should like to have seen the procession. It seems that Mr. Stephenson's pulpit at Caban Gwyn was made into a pew for Mrs. Stephenson at Rehoboth - a quaint thought and a fitting recognition of a sacred relationship. From strength to strength the church went on with a flowing tide all in its favour. It is recorded that from twenty to thirty new members were received month after month for a considerable period. There was much industrial prosperity, too, the Nantyglo works becoming more and more flourishing. What a bee-hive of industry the whole of the locality must have been just then. Here and there could been seen along the mountain sides small parties burrowing for coal veins, sometimes succeeding, sometimes not; close by were others engaged in unearthing and scouring what iron ore there was in the district. Along the precipice track between Brynmawr and Llangattwg there was a regular service of mules in long files carrying lime for the use of the various industries, and on Saturday morning might be seen carriers from Cardiganshire arriving with their heavy loads for sale at the Nantyglo market. These primitive merchants would start early on Friday from the sea coast of Cardigan and arrive at Trecastle in time for a brief respite at one of the inns there, and then resume their journey before dawn in order to improve their chances at the early market. There were interesting times, leisurely beyond our comprehension, moving as we do at the warning of hooting cars and purring motor cycles, and whistling trains. Their burden consisted of farm produce and fish and fowl and home-spun material. But these merchants too, would carry letters and remembrances from the home county to relatives who had settled here - the love of parents to their sons and wives to their husbands. Occasionally, too, the preacher for Sunday would be hemmed in between the good things, and it was in this fashion that many of your ancestors arrived here to settle down and to marry and bring up families of whom you are descendants. Being curious and inquisitive in this particular lore, it gave me much amusement to trace some folk back to their ancestral origin. I found that the great majority came from the sweet shire of Cardigan; others from Carmarthen, Radnor, and naturally, Brecknock. The least represented county was Pembroke. Surrounded by a throbbing community of this like a live church had ample material to build with, and a public to appeal to - opportunities which Rehoboth evidently seized and used to the full. With an eye to further efficiency, in 1832, we find that the deacons were elected for the first time in the history of the church. They were five in number, viz., Wm. Rees, D. Seys Lewis, Thomas Williams, Lemuel Smith, and John Davies. This had become imperative as the result of the phenomenal progress of the church, which was now nearly 300 strong. Both minister and church were fated to know all that was to be known about building - they were builders in more than one sense. In less than twenty years we find them embarking upon a new building scheme, enlarging the chapel a third time at a cost of �92 2s. 2d. It was then that Rehoboth assumed its present dimensions and form, and we gaze today upon the identical walls which were dedicated to God on July 20th and 21st, 1840 - quite an ambitious scheme in those days. An illustration of the brotherly feeling existing between the churches of the town we read that the members of Rehoboth worshipped at Tabor while the new chapel was being built, holding their services at such hours as would enable Tabor to carry on its own interrupted. On this occasion how very generously did Rehoboth repay the Tabor friends for their hospitality! During these very months a mighty revival broke out, in which the two churches shared freely, and as the result of which between 400 and 500 members were admitted at Rehoboth alone. It was inevitable that the petty quarrels of which we read during the earlier years should die away in the heat of the revivals which occurred and recurred with such frequency. It is a true dictum that "Christendom was once rent on a diphthong," and its most serious crises have been the result of minor questions. The quarrel between the Western and Eastern Catholic Church arose over the advisability or otherwise of shaving a Priest's head! And so had the peace of Rehoboth been broken by forms of discipline and lesser issues still, until the last Church sailed away from such perilous shallows into a more tranquil mid-ocean, free from squalls and all cross currents. Below: view of the rear of the church and a portion of the overgrown cemetery at Rehoboth. The key to any epoch of great events is, without exception, personality, and the outstanding feature of every locality is generally due to an exceptional individual who may have lived in a remote time and become entirely forgotten. The dominant factor of personality is inestimable. The chapter of high deeds and marvelous achievements we have just detailed in the history of the Church in an industrial area calls for an explanation; it is not the cumulative effect of a set of blind circumstances. The explanation of this chain of wonderful events and triumphs is undoubtedly the Rev. D. Stephenson himself. Take his name out of this romance and the whole fabric collapses: one wonders whether there would have been this beloved Rehoboth at all. His name and personality are interwoven with all its movements, its trials and conquests. We deem him worthy of a chapter to himself. He was born in 1774 in Carmarthenshire - the illegitimate child of a Carmarthen solicitor by a Llandilo maid. As an infant he became the charge of a foster mother at Closygraig, near Newcastle Emlyn. She was, however, a good mother, and brought him up with an affection worthy of a mother indeed. When sixteen years of age he succumbed to the lure of Merthyr and its rosy prospects. Settling down at Cefn, he joined the Pontmorlais C.M. Church, where he was a useful member for some time. Eventually he became a member of Zoar Congregational Church, under the ministry of Rev. D. Lewis. He also was a member of Ynysgau after that. He earned his living by hard manual work until his reputation as a diligent and honest man brought him to the post of check-weigher, at which he began to prosper in a worldly sense. He was careful to fortify himself with religious friendships and religious literature. He was really converted under the ministry of one Mr. John Bowen, a C.M. minister. It seems that he was elected to join the Militia when 21, a thing altogether contrary to his disposition, and that he found it anything but easy to free himself. It meant finding another man to take his place, and even then a substitute would cost him from � to �. This was a time of great anxiety. Should he find the willing man where was he to get the wherewithal? Not a stone was left unturned to secure release. For the first time he sought favour of his father in Carmarthen. Did he feel like granting it he was certainly in a way to do so, but he cruelly withheld it. In other directions too, he sought help, but with no response. At last, however, an Englishman of no definite religious conviction lent him �, to be repaid at a stipulated time. David Stephenson, destined to wear anything but a red coat, kept faith with the generous man and paid back the borrowed money without fail, and was again free to indulge his religious tendencies and to foster the deep passion for preaching which was in his heart. In 1810 he married Mrs. Howells, of Cefn, a widowed lady carrying on a small business in that village. Three children were born to them. Soon after he got married he had to face financial difficulties arising out of his wife's affairs. This crippled him for years to come, but nothing daunted by the affairs of this world he remained loyal to his religious obligations and intentions, sharing his wife's troubles to the full until at last the deficit was paid off and the sweetness of life was again his. We next find him living at Rhymney, and taking an active part as a member of a small community which developed into the Zion Church of today. Congregationalists in the upper reaches of the Rhymney Valley were members of Merthyr churches up to now. Their growing numbers, however, tempted them to start a cause of their own. It was these people that invited him to commence preaching. To be frank. David Stephenson was never considered to be a brilliant man, but he was very much beloved by all, and he possessed a large measure of the sense which governs every other sense. He never published a sermon and never aimed at any literary work, and yet when the story of his life is written what a dazzling literary record it makes, and how splendidly he justified the trust placed in him when asked to preach his first sermon. 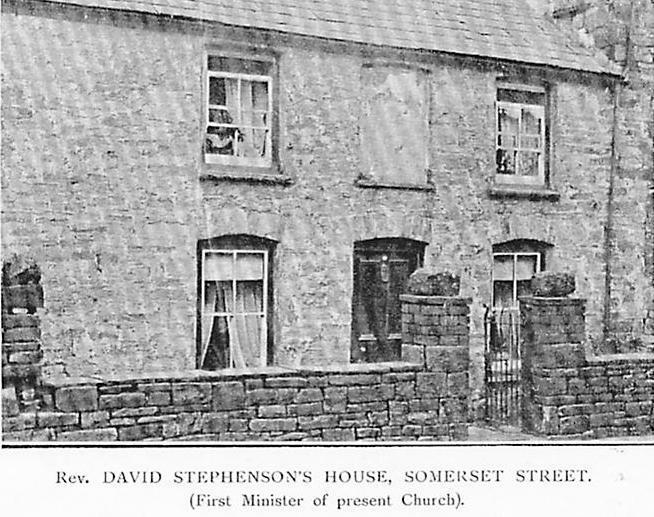 The Church at Rhymney having been formed, Mr. Stephenson was asked to take over its charge, not unanimously, however, for one "Andro'r Saer" seems to have opposed it stubbornly, very likely on intellectual grounds, for Mr. Stephenson was absolutely untrained from a collegiate point of view. There were opponents among ministers, and it was only after much discussion at several quarterly meetings that a majority for his ordination was secured. The date of that event is June 27th, 1821, when he was 37 years of age. Zion Church had no chapel as of yet, and it was arranged that he should be ordained in the open air outside his own house, and accordingly a stage was erected adjoining the pine-end of the cottage! What a quaint spectacle it must have been, and what a suggested contrivance. The Apostle Paul was sent "afar off" to preach his Gospel, but David Stephenson's life had been so consistent that he was going to be ordained at home and for home. However, the Twyncarno M.C. Church came to the rescue and offered their chapel for the purpose, and it was there that the ointment was broken upon him. While a minister in Zion with its sixteen members he pursued his daily vocation of necessity. He also preached fortnightly at Caban Gwyn, whose pastor then was the Rev. Mr. Thomas, of Penmain. Mr. Thomas by now was in failing health, and on a certain Sunday night he ventured to announce that he had asked Mr. D. Stephenson to take charge of the church, and that he had kindly promised to do so. And so, without a "call" from the church itself, he was duly ordained at Horeb in 1823, when its members numbered only eighteen. He continued to live for a while at Rhymney, and his experiences in crossing the mountain between Nantyglo and Rhymney are many and varies. On one occasion, after walking through the snow to preach at a cottage service, he had such a soaking that he had to discard his boots and stockings, placing them near the fire while he proceeded with the service. When he was half way through, glancing towards the fire, he noticed that his boots were burning, and after much hesitation as whether he would rescue them from perishing or keep on preaching he at last decided in favour of the latter course, to the amusement and admiration of his hearers. On another occasion, on his way home after a Sunday evening service, while on the mountain an unscrupulous Will-o-the-wisp led him astray into the bogs; he continued to follow it helplessly until dawn, when his aimless guide left him to discover his folly, arriving home in a queer physical and mental condition. In course of time he relinquished Rhymney altogether, settling down, as we have seen, at Nantyglo. We have already mentioned many of his triumphs, but there were some adverse circumstances too. Of poverty he saw enough - too much. Yet in every difficulty there turned up a friend. We read of one gentleman ordering 5/- worth of groceries to be sent to his house. On another occasion the Sunday School presented him with a suit of clothes, and the old preacher on wearing them the first time to go to Rhymney, turned in during school time, at Caban Gwyn, bowing gracefully to his friends in gratitude for so rich a gift. His boots, too, were letting in water it seems, and his friends made him a testimonial of a pair of Wellington boots - the only effective rig-out against the rigour of the weather he had to brave on these barren mountains. Concerning his physique we are told that he was a short thick-set man, five feet six inches in height. The Rev. Griffith Hughes, Groeswen, preaching his charge at his ordination service said: "My congregation today is a small one - one man - and he is not a very big one." He was evidently very popular among all denominations. Several things made for this. He himself had been brought up a Calvinistic Methodist, and remained on friendly terms with that denomination to the end. His wife was a Baptist, and never severed her connection with the Baptists, but was allowed the privilege of communing at Rehoboth. She could hardly love her husband and refuse the Sacrament at his hands. Add to these incidental factors his genial disposition and his total freedom from self-aggrandisement, and it is not difficult to understand why he stood so high in the estimation of all. His reputation as collector of money is matchless. That was a memorable journey of his when he toured Carmarthenshire and called at his father's home, being dismissed with the gift of one penny! At another place he was announced to preach on a week-night. The service over, he stood at the door holding out his hat for subscriptions. Not a single penny was received. The good deacon who held a candle over the hat, being moved to compassion, sank deep into his pocket, and out of his safely tied leather purse gave him a shilling, but asking for eleven-pence change! David Stephenson seems to have done far better at home. Many and original were his schemes. Sometimes he would go right into the crowd, hat in hand, and he never failed to get something. On one occasion he managed to secure a fiddle which had been won at a bazaar, and for which he got � A potato merchant had several times refused to respond to the preacher's appeal for a gift; but when he sold his donkey, and went in for a horse - an unmistakable sign of prosperity - the preacher would persist that he should give him the donkey to be sold in the interest of Rehoboth. Ladies were also rebuked if they dressed too luxuriously at the expanse of neglecting chapel debt. Once, a young man had promised him his watch, but did not carry out his promise. The following Sunday night the preacher referred to the incident, without mentioning the delinquent's name, with the result that the watch and chain came back on the plate safely enough. On his collecting tours he used to carry two bags, and he called them his "lucky bags." But above everything else he was a great success as a spiritual advisor and shepherd. In 1839 he received as many as 400 - 500 new members into communion. In 1849 there were between 500 and 600 candidates for membership. His wife predeceased him by a few years only. As a token of respect, the church insisted that she be buried beneath the "big pew." Mr. Stephenson did not agree, for he said: "I shall always be standing over her." Being reminded that he himself would be buried there, he submitted to their wishes. 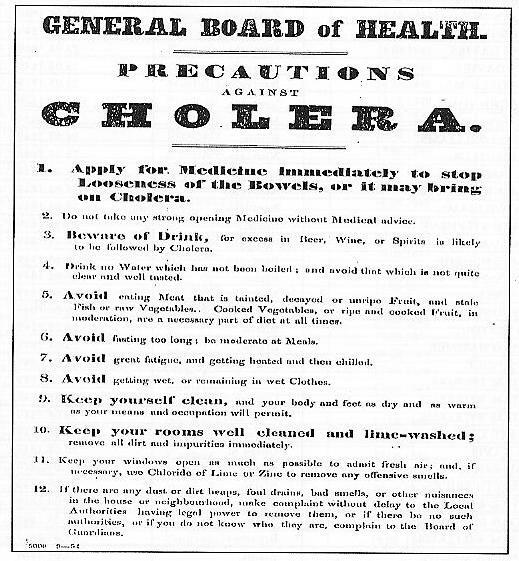 The year 1849 was a reign of terror in these parts - a fatal form of cholera counting its victims by the thousands. This partly accounted for the rush for membership which we have mentioned. Mr. Stephenson was in a way a victim to the terrible plague. He preached his last sermon August 12th, 1849. On the following Thursday he was taken ill, and on August 22nd he passed away, muttering the word "Gogoniant" (Glory). One of the last men to see him was Dr. T. Rees - later of Swansea. He was laid to rest with his wife beneath the "big pew" at Rehoboth on the following Friday, amid signs of great lamentation. All the shops were closed the day, and the church was full to overflowing. Those who were wishful to take their last glance of him were asked to come forward, after which Dr. T. Rees delivered an appropriate address. Immediately after the remains were committed to the earth, a service was held, when the Rev. D Davies, New Inn, preached the sermon, the Rev. H. Daniel (Pontypool), and the Rev. M. Jones (Varteg), also taking part. This web site is copyrighted � 2004 by Jeffrey L. Thomas, with all rights reserved.